I take no credit for this. I’m teaching Precalculus for the first time, and the other teacher also teaching it has been doing this for years. 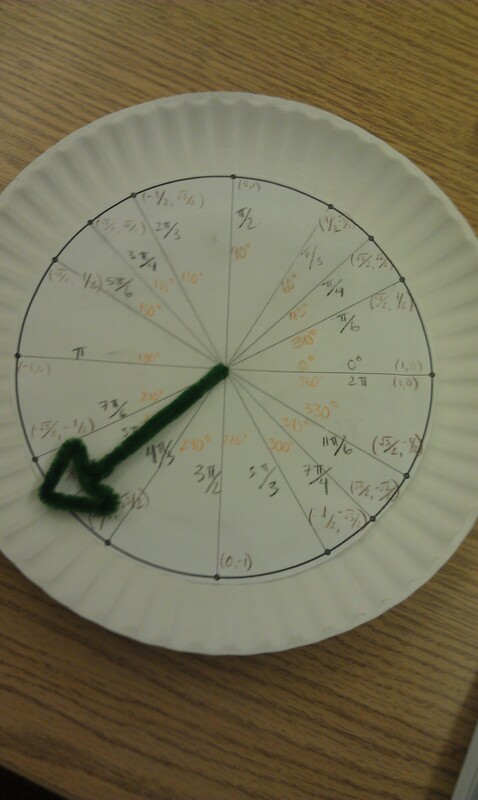 We introduced the unit circle and then had students make these precious unit circle plates. It took about 10 minutes at the end of one day, and another 15 minutes at the start of the next. 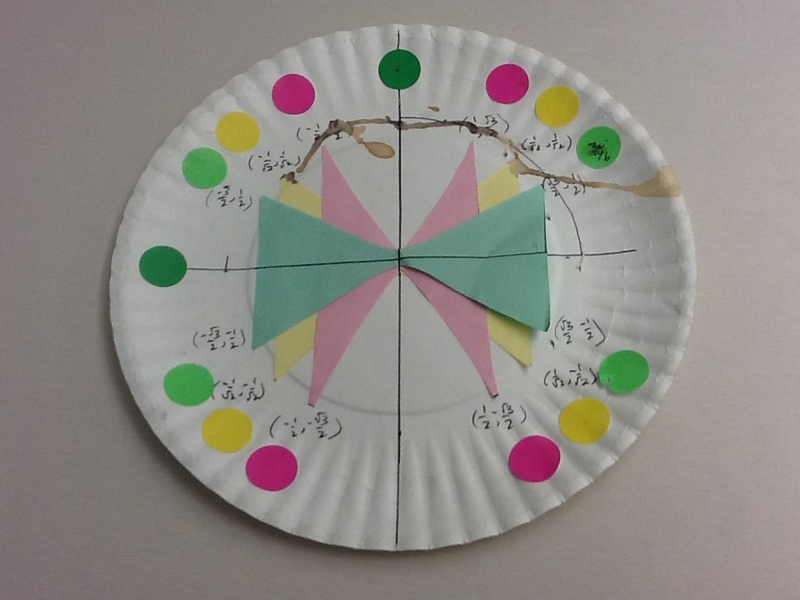 In order to make them, I gave students a sheet of paper with the unit circle on it, and dots at the relevant points on the edge. I had students draw the angles in, write down the angles in radians and degrees, and calculate the points in the first quadrant. Then I had them use symmetry arguments to get the points in the other quadrants. Then they cut the circle out, glued it to a paper plate, and stuck a pipe cleaner in the center to become the terminal angle. Because I was rushing through the curriculum faster than I hope, I had studentsuse the unit circle plates to find the sine, cosine, and tangent of some special angles, and then I had them put the plates aside. That’s all the use we got out of them thus far. So right now, I’m not sure if the time was worth it to build them. However, I think when we get back from Thanksgiving, when we start solving trigonometric questions, I’m going to have students pull these out and use them at the very beginning… Keep things concrete. And as we progress through the lesson, ween them off. They’ll see there are a couple of solutions. I’ll give some questions with one solution, with two solutions, and no solutions! And then we’ll figure out how to solve these without the unit circle plates… and look at the graphs… and all that good stuff. Just a thought. And, of course, we can use the plates to construct the basic shape of the graphs of and and . If you can think of any other good uses for the plates, lemme know! I really like being able to use symmetries in class, but the chances seem irritatingly rare unless it gets into modelling some physics problem where you almost have no choice but to use it. I’ve done the plate thing before. They’re ok as a craft but impractical as a continuing resource. I’ve had better success doing the derivation together and having them create a nice version in their notebook. Sometimes I give them a printed one to supplement it. 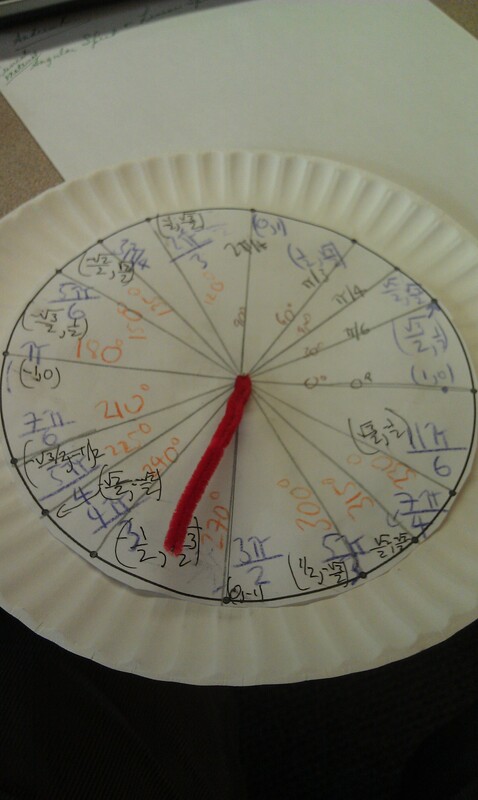 The problem with Pre Cal is the unit circle is super important, then not so much and then months later you need it again. So I don’t know how well the paper plate holds up. Interesting thing I never considered… My fingers are crossed that they will hold up for the next few weeks… I’ll let you know!!! I could also let them keep them in the room and we grab them when we need them. Yes, the degree/radian measures go in the dots. I like your last example. When I last taught this, we focussed (too much) on the special angles and when the reference angle is not 30/60/45 we picked up our calculators. This is a nice task to have students try before reaching for the TI.